(Originally published in the Boulder Weekly) Bluegrass music culture embraces its traditions. They dictate that the acoustic instruments involved and the subject material of bluegrass lyrics from death and heartache to murder, infidelity and trains, all set to a pleasant melody with a driving beat. Traditionally, that finale stage is almost completely full of men. 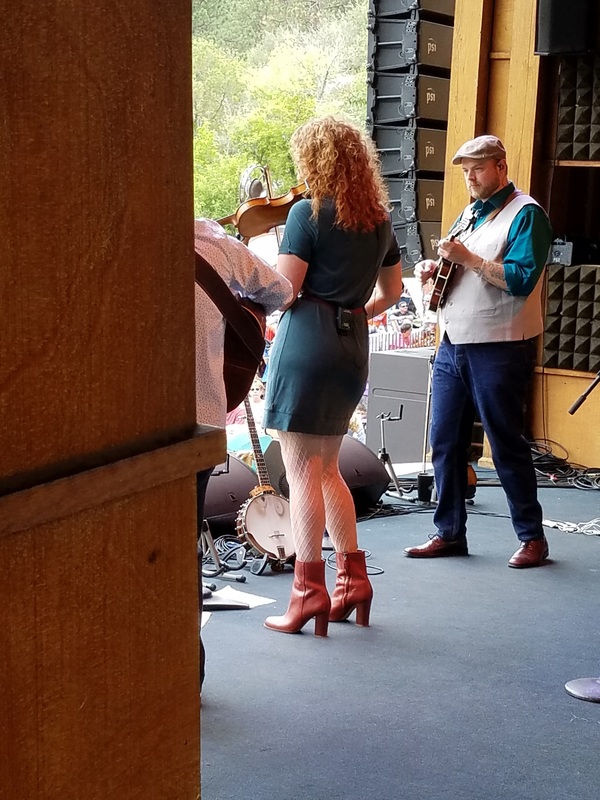 There can be five manly mandolinists but typically no more than one or two women although Colorado’s notably progressive bluegrass festivals do a better job. However, never have we seen an end-of-set stage jammed full of women musicians with one guy playing the bass in the back. That longstanding ritual stands a chance of changing July 27-29 at the 45th Rockygrass Festival in Lyons. This year’s lineup showcases a wealth of talent including two all-female bands. Banjoist Alison Brown has gathered an all-star band featuring female bandleaders who are also winners of the instrumental honors from the International Bluegrass Music Association. Also on the bill is Della Mae, a young, fast-rising band featuring Kimber Ludikerdle, Courtney Hartman, Celia Woodsmith, Jenni Lyn Gardner and Zoe Guigueno. The weekend’s roster of 20 or more female players includes local favorites KC Groves, Natalie Padilla and Sarah Cole of the Lyons Bluegrass Collective and award-winning fiddler Ellie Hakanson of Jeff Scroggins & Colorado. Bill Monroe is known as the “Father of Bluegrass Music,” but he never identified the “Mother of Bluegrass Music.” The DNA points to Mother Maybelle Carter, Hazel Dickens and Alice Gerrard followed by Claire Lynch, Laurie Lewis, Lynn Morris and Ronda Vincent. However, one woman stands above all in transforming bluegrass. Alison Krauss is regarded as bluegrass’ quintessential singer, fiddler, bandleader (of Union Station), concert attraction and someone who reaches beyond bluegrass to harmonize with Robert Plant. “Everything changed when Alison Krauss came on the scene. Her hiring me to play in her band gave me a tremendous boost,” said banjoist, producer and Compass Records founder Alison Brown. If not for the siren call of bluegrass, Brown would have become an investment banker. “When I was starting to play fans would tell me: ‘You sure do pick good for a girl.’ I took it as a statement of fact. I didn’t hear it as a putdown,” Brown said. Brown will be joined at Rockygrass by bassist Missy Raines and guitarist Molly Tuttle with Sierra Hull on mandolin and Becky Buller on fiddle. “Usually the woman in the band is a vocalist. I thought it would be interesting to have an all-female band made up of great instrumentalists and claim that sonic territory,” Brown said. The internal dynamics are different. “Women are taught to build consensus. In this band, everybody says ‘Let’s cut my solo.’ The urge is to do what’s best for the song. There’s less testosterone-driven shredding. We tend to gravitate toward the melodic,” Brown said. 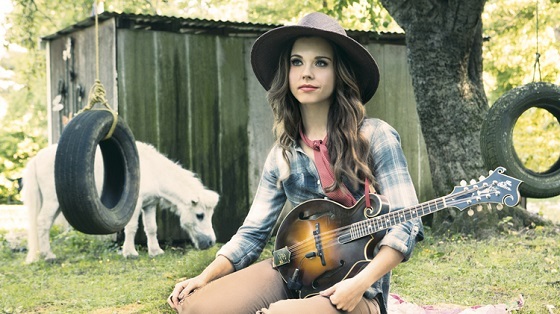 Singer and mandolinist Sierra Hull released her debut album in 2008 at 6. Her recent Americana-tinged “Black River” collection features Krauss, Rhiannon Giddens and Abigail Washburn. “I remember seeing a Rhonda Vincent album when I was real young. I knew I was going to play the mandolin but that was the first time I saw a woman holding a mandolin,” Hull said. Hull’s first performance in Colorado was as a 12-year-old invited by Alison Krauss on the post-“Oh Brother Where Art Thou?’ tour that stopped at Red Rocks. It’s not that Hull hasn’t noticed she was the only female onstage for various jams. “I didn’t think it was intentional. It was just the way it was. These days bluegrass is trying to be more open and inclusive. It’s exciting to see women getting a seat at the table,” Hull said. However, Hull said, it should be more than once-a-day seats. “You have three-day bluegrass festivals with only one female-led band per day. ‘We’ve got our girl band for the day,’ they say. I’m not complaining. It’s just that each of us does something very different musically. I would never want to be hired because I’m a woman,” she said. Becky Buller’s role models range from Alison Krauss to rocker Joan Jett. “I’ve had a pretty easy go of it. Nobody ever told me not to do anything because I was a girl,” said Becky Buller, an award-winning fiddler. “I really appreciate what the pioneers did for us. Now there are other barriers to break. The playing field should be more level,” she said. As the conversation concluded a young voice is heard. “That’s my 5-year-old daughter. Being a mom is my main gig but music has been part of my life from the beginning,” she said. Buller learned songs on her mom’s knee and now teaches her daughter to sing. Things will have really changed when the sight of women musicians is no longer noteworthy. “I hope we get to the point that it’s all about music, not gender,” Buller said. – Missy Raines (bass), Molly Tuttle (guitar), Sierra Hull (mandolin), Becky Buller (fiddle) and Alison Brown (banjo).